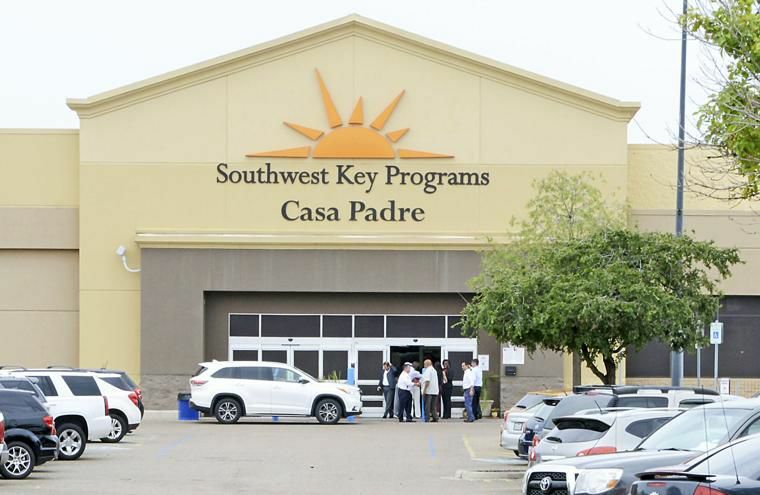 A Southwest Key Programs shelter is seen June 28, 2018 in Brownsville, where children who have been separated from their families are detained. A Cameron County court last week appointed an investigator to determine whether an unknown number of undocumented children held in the Southwest Key-Casa Padre facility are in need of guardians to represent their best interests. Cameron County Court-at-Law No. 4 Judge Sheila Garcia Bence signed an order initiating that investigation on Wednesday and ordered Southwest Key to allow Ad Litem investigator Hailey A. Hobren and six court-appointed guardians access to each child held in the Southwest Key facility on Padre Island Highway. Bence ordered the nonprofit to allow the group to conduct interviews this past Thursday and Friday. Southwest Key Programs, a nonprofit that contracts with the Office of Refugee Resettlement to house detained unaccompanied minors and undocumented children separated from their parents, did not comply with the order, even after a Cameron County Constable served the organization on Friday. Instead, a lawyer with the Department of Justice removed the matter to federal court, Hobren said. “We’re going to have to put in a report to the court because my job as an investigator is to report. So we’ll have to report back what happened, and, basically, we went Thursday morning and they wouldn’t let us talk to the kids,” Hobren said. So, Hobren had a constable serve Southwest Key Programs Friday morning and still got no access. “So we did try twice,” Hobren said. Southwest Key Programs did not respond Monday to an emailed request for comment.